DRIVING INSTRUCTION FROM CAUSEWAY TO TG. LEMAN. 2. Clear the Sultan Iskandar Customs, Immigration and Quarantine Complex. The exit ramp swing left on exit, follow the road and kept left past the petrol kiosk. Keep to the left side of the road, as you do not want to go on the 2 right most lanes that lead you up the bridge. The left most lane bring you beside the overhead ramp, and at the bottom near the road junction you need to turn right under the bridge and you're now on highway 3. 5. Drive pass the second Kota Tinggi exit. At this point if you look at the map, to turn right is Highway 92, that is the road to Desaru, Sg. 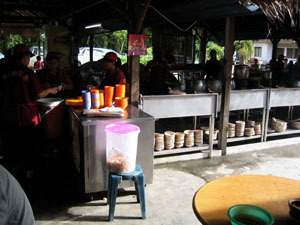 Rengit town and Pengeran. 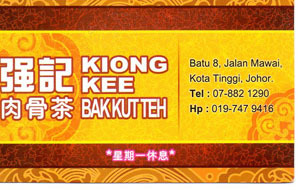 To turn left will bring you into the Kota Tinggi. Proceed forward about 500m and the old and new Highway will merge back. 6. This is for anglers who are interested in buying live prawns, about 400 to 500meters after the highway 3 merge, there is a blue zinc building by the left side of the road that sell live prawns. You need to pre-arrange for the live prawns if you're buying, the number to contact is painted on the building. Or contact me for the number. If you're not interested just drive on ahead. 8. Along the way there are milestone markers, it'll count down towards KUANTAN. From here onwards we'll use this milestones to guide the way. 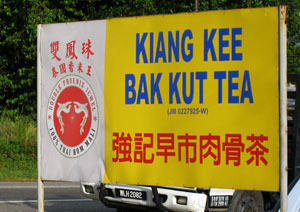 FYI, at the milemarker "KUANTAN 275", there is a famous Bah Kut Teh stall that is a hit with many heading to Tg. Leman. Its on the right side of the road pass the mile marker. If that doesn't interest you just drive right through. 9. When the markers count down to "KUANTAN 240" make a RIGHT turn at the next junction which is about 10 meters after the marker. ( There should be some barricades and a little security post by the side of the road after you've turned as seen in the image below, this road is marked with a thin grey line in google map). 10. When you turned into this smaller road you should see milestone markers counting down towards TG. LEMAN. Travel straight until the mile marker count reaches TG. LEMAN 13 ( the word "TG. LEMAN" has dropped I believed, so there is only a 13 there now. Not sure if they have fixed it. ). Pass the road marker about 100/200m or so and take the LEFT turn. There should be many direction signs indicating "Sibu Resort", etc. 11. There should be more milestones with TG. LEMAN on it. There are oil palm plantations on both side of this road. 12. Travel along this road for another 10 to 11km and you pass some school like buildings with a soccer field on your left, heading straight for about 50m and the tar road will suddenly end, but there is another tar road turning right. There is some sign in Malay along this road directing you to the ferry point car park. Turn right and follow the path straight towards the Ferry Point (or jetty as we call it). Just follow the road straight in till you come to a carpark attendant's booth, don't veer right along the way, as the first right turn off is to a resort which is quite new and grand, you should be able to see it once you turn into this lane, and the next right is to some chalets. 13.The carpark is rather big, drive all the way to the end to where the jetty is so that it's easier for you to unload. Above left, this sign board is on the right side of the road if you're driving toward the direction of Tg. Leman. Attached is the name card I got from the vendor when I drop by for breakfast on one of my trip, they are open from the morning till about 1pm. They're close one day a week, do call them to check if you're heading there to avoid disappointment. 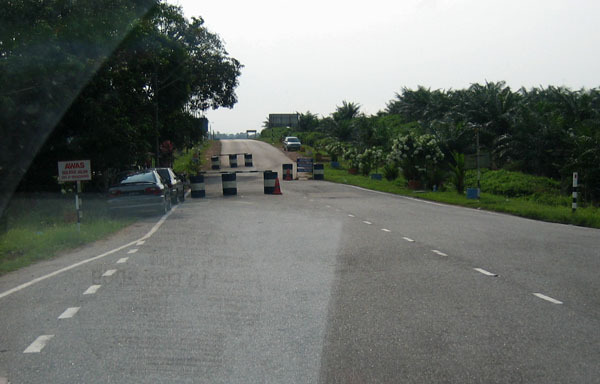 Image of the security post then you turn right from Highway 3 (after KUANTAN 240 ).